Fosshape is a plastic felt-like material available in different thicknesses. Its plastic fibers will contract when heated and its this property that makes it stiffer when heated. 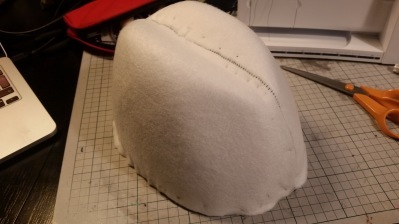 Easiest way to shape it is around a shape or something else to stabilize it during the heat-treatment. 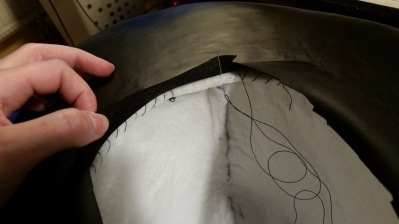 “Real” hats are often shaped around something called a hat stock and it’s exactly what’s easiest with Fosshape as well. 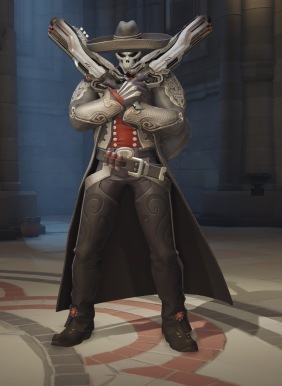 For this tutorial we will look at how I made something as big as a sombrero for my Mariachi Reaper cosplay from Overwatch. Because the brim is so big, it was easiest to create the hat stock in two parts: The brim and the crown. 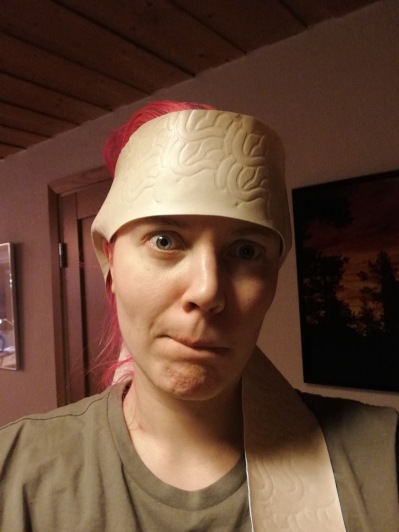 First get a hint of how big you want your hat and the shape of it. 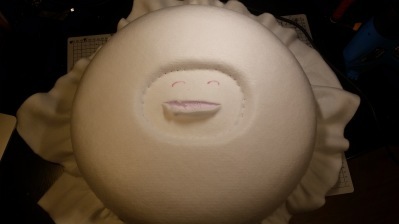 Transfer this to a block of pink insulation foam (it can be blue, white or some other color as well =P ). 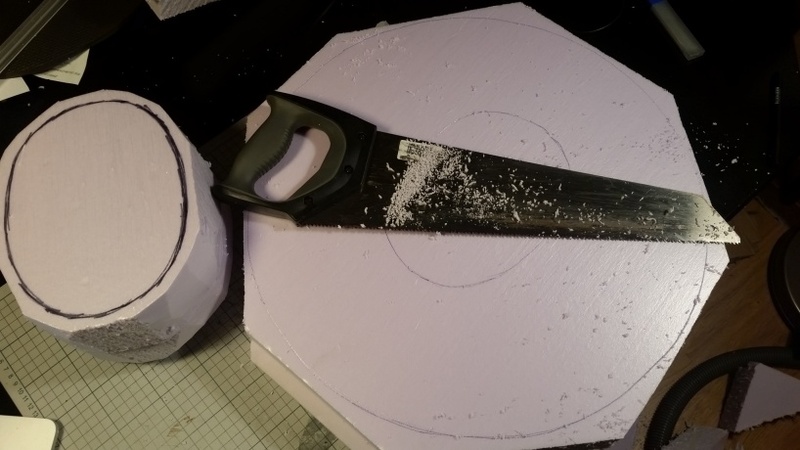 Don’t use normal Styrofoam, it’s much too grainy and you wont get a nice smooth shape. 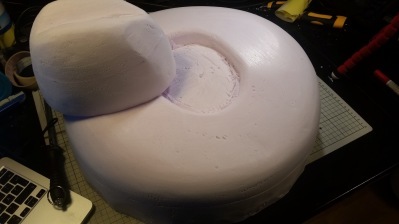 Good insulation foam can even be sanded! 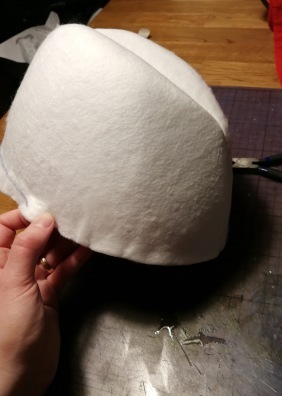 Make sure that you make the crown shape taller and the brim thicker than the final shapes. That way there will be enough room to pin Fosshape around the shapes. 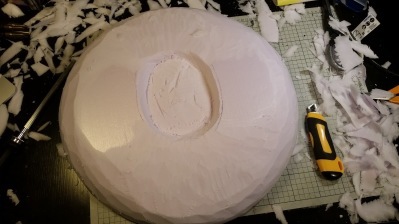 Continue to refine the shapes and eventually also sand it smooth. Pin a nice big piece of Fosshape to your shapes. For a project this big I chose the 6 mm version. 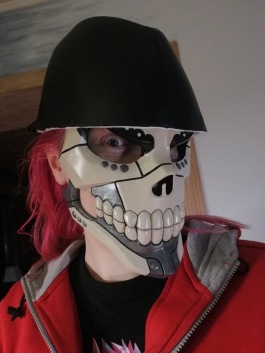 Don’t use pins with plastic heads! I find pins with small metal heads are best. 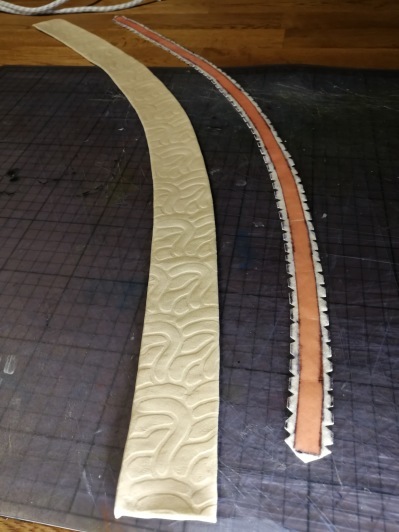 As mentioned at the top, the fibers need to contract to make Fosshape rigid so make sure to leave some slack and ease when pinning. Trick is to leave just enough but not too much (it can only shrink as much). There shouldn’t be any need to cover the pink insulation foam with aluminum foil or anything first if you don’t use anything warmer than steam in next step. 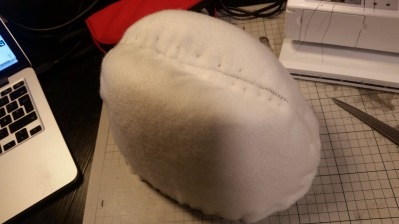 Oh, btw, it works wonders to sew Fosshape with your sewing machine before heating it! 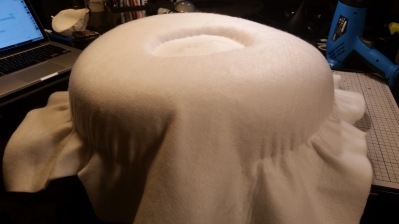 Now use a steamer or an iron with steam function to activate the Fosshape. If using an iron, set steam to maximum and temperature to lowest that still allows for steam. 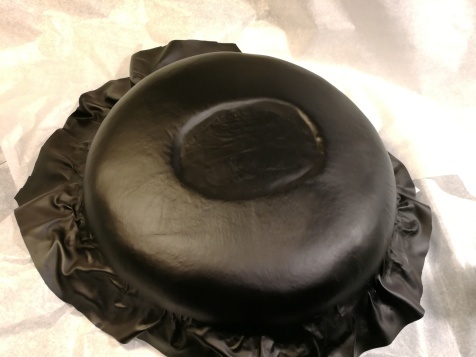 Press gently all over the Fosshape and watch it shrink some and lay flat against your carved shapes. Take care to not work the same area for too long or the Fosshape can start to melt together a little bit. Easiest is to use a plier to remove all pins and you should be able to get your hatyou’re your form easily. Use a sharp scissor to cut your parts into desired shape. 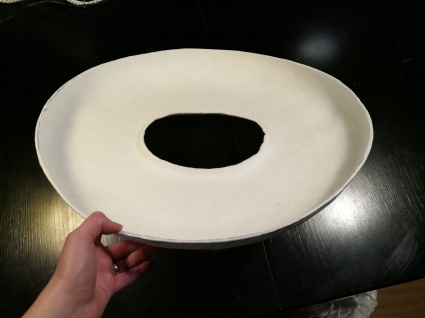 Try to match crown bottom shape and brim hole as good as possible. 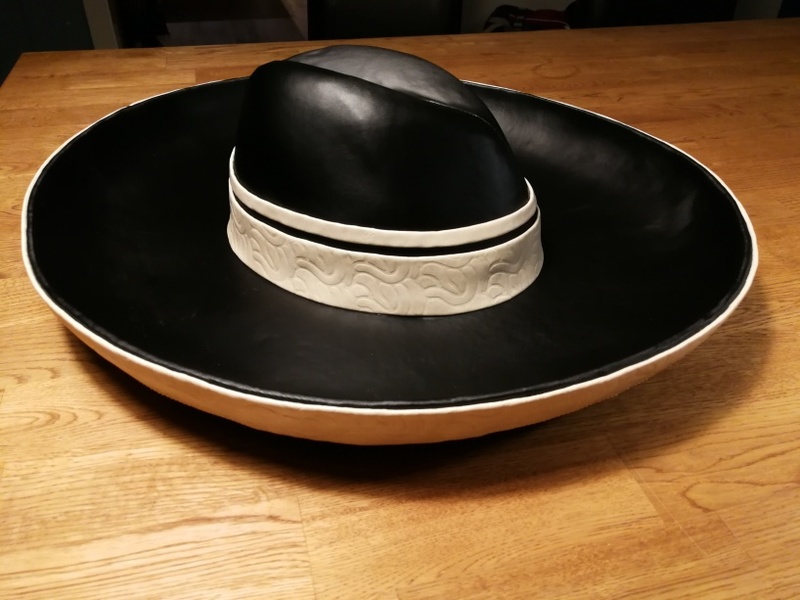 My sombrero should look like its black fake leather with white details so I used spray glue to glue 4-way stretch pleather to the brim and contact cement to glue it to the crown. 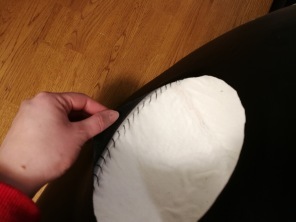 Use some sturdy thread and needle to sew the brim and crown together. More decorations? The sky is the limit! 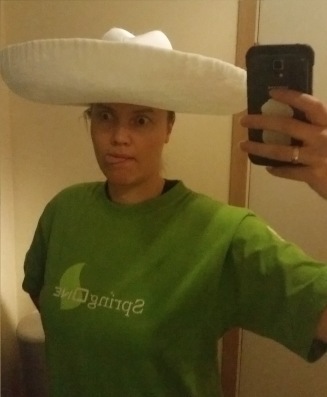 My stylish sombrero required some white details. Awesome enough they were perfect to hide the edges of my black pleather. I used orange double sided tape to keep it in place while sewing. Chillax and realize how well protected from the sun your eyes are. 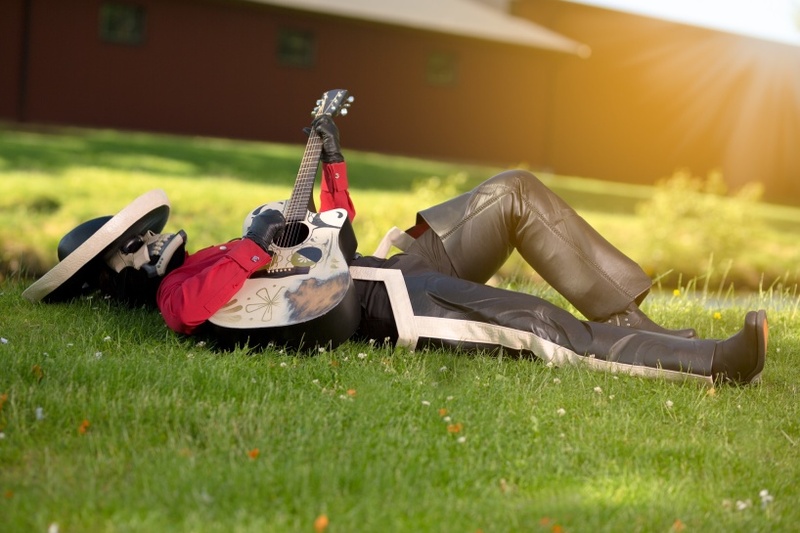 Maybe crank out that ol’ guitar hmm…?